“Muliebrity” is coordinate term to “virility,” referring to qualities of femininity. Southwestern College staff, faculty, and students were invited to explore how they connect with and empower the feminine aspects of the self, community, or greater collective via artistic processes. The Wild Heart Gallery is proud to present a series of artist statements from this exhibition which runs until January 2017. Micaela Wood “Sitting Still and Looking Pretty.” Photo by Laura Murphy. In considering how to empower, celebrate, and connect with muliebrity, crown images immediately come to mind. A seashell crown in particular is representative of feminine power, drawing on the mermaid archetype for the mysterious anima. Many ocean treasures are incorporated into such a garment, including pearls, beach glass, and of course, seashells, which symbolize feminine nurturing and protection. Furthering the symbolic power of the crown, many theologians argue that the Judeo-Christian Bible alludes to women as the “Jeweled Crown of Creation”. Femininity is depicted in the book of Genesis as the final, astonishing work of God, filling a place in the world that nothing and no one else can fill. With such gifts, strength, power, and value, what a shame is it to only be expected to sit still and look pretty? 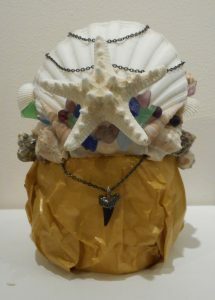 Materials: Seashells, beach glass, wire, plastic, gemstones, and other mermaid treasures.